We do family dinners with Brian’s brother often, usually switching between houses. I cook, he cooks, I cook, and so forth. There has been a lot going on with both of us, and we are going to the house of the person that had more time to make dinner. This particular weekend he was going to make dinner but couldn’t, so I did. I didn’t have time to go to the store to get anything, so I asked him to pick up some veggies and pork. I was thinking he would get usual and I didn’t need to be specific, you know, lettuce, squash, broccoli, something along those lines. Well I should have known this would happen, he walks in with radishes and jicama and says, “here is your basket of secret ingredients” so make something. This is not a bad thing, more humorous than anything, especially if you knew him, I should have know! Ya he did, he pulled a Chopped on me. If you don’t know Chopped, it’s a show where there is a basket of secret ingredients and you have to make something from those off the cuff. Something he may not have known is that Mexicans eat jicama like no ones business. I have lime, and olive oil. BRING IT! I am not sure he was expecting what happened next, but it came together in about 10 minutes and it was amazing. Amazing. So fresh, light, sweet, and acidic, which is perfect for a hot summer day. This recipe was inspired by that day, so thank you brother in law:). 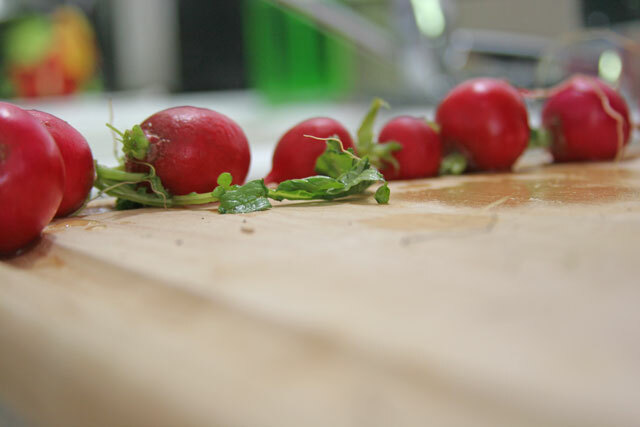 That day I mixed olive oil with lime, salt and pepper as the dressing, thinly sliced radishes and jicama. It was perfect and all I had. I am just happy I had lime! 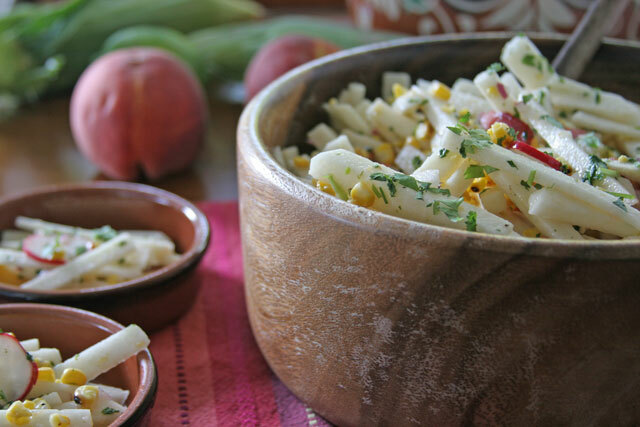 But for this recipe I stepped it up a notch to get a little more sweetness with the peach and different textures with the corn, plus it never hurts to add cilantro to a party. This makes a lot of salad, great for leftovers, a summer potluck, or for the a long week of work. 1. Peel the jicama, julienne it, set aside. 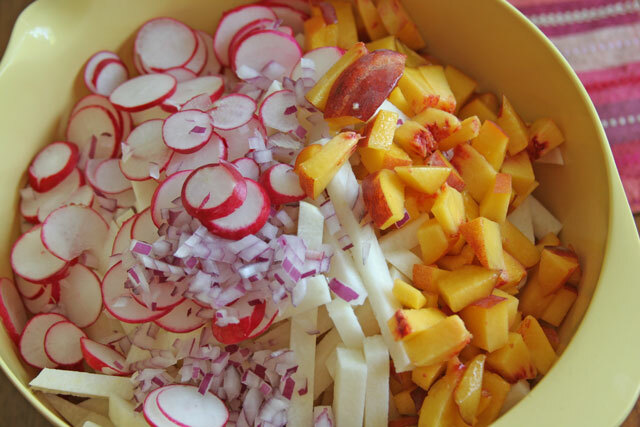 Medium dice peaches, slice radishes thinly, finely dice onions, set aside in a large bowl with a lid if you have one. Clean the corn and get it ready to char. Grill corn for 15 minutes turning every few minutes until it has a good char, not burned, on all sides. Cut kernels off, set aside. 2. 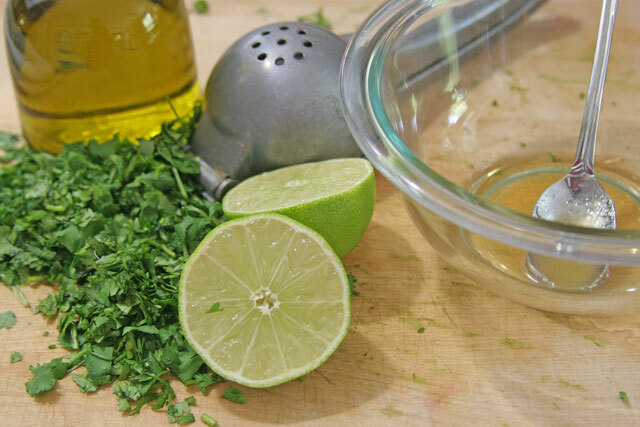 In a bowl pour the honey, lime juice, and lime zest, whisk together. Making an emulsion… While whisking, slowly drizzle the olive oil into the honey mixture, mix well. Add the cilantro, and mix well. Add about 1 tsp or salt and fresh ground pepper. Taste it, need more salt or pepper? Add a small pinch more if necessary. 3. Place the charred corn in the bowl with the other veggies and fruit, pour the dressing over the top, place the lid on and shake it. That’s it! You should totally make it! The salad is delicious. I recommend letting everything soak in the dressing overnight! You’ll love this dish 2 or 3 days after making it. I know this may sound odd, but drink the juices that are left at the bottom of the bowl when you are done eating the salad. Soooooo Good. This salad is delicious! It is the perfect side for a hot summer BBQ! Thank you, I’m happy you like it:-)! Awesome! Well I hope you make it soon, it really is refreshing and tasty. This one looks lovely, and between the peaches and the charred corn it’s the essence of summer! I should use jicama more, I’ll save this recipe for that purpose. I wonder what would happen if you grilled the peaches, too? My husband has grilled so many peaches lately, I can hardly eat them any other way. I would grill the peaches for sure, it would be amazing! 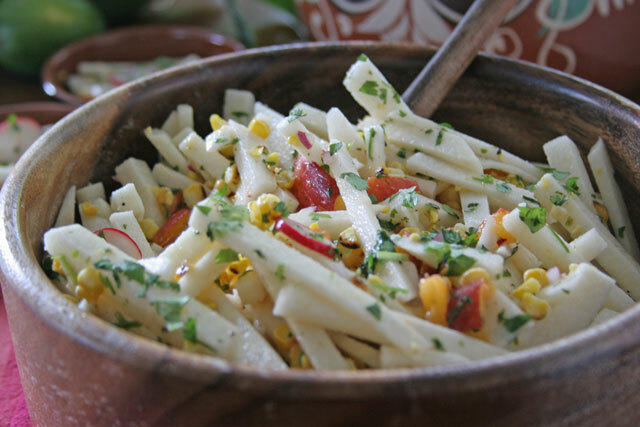 I love jicama in salad and that honey-lime dressing sounds delish! It is so good, I think you will love it!